It became apparent that we were in the company of a consummate artist during Sarah Simblet's magisterial talk on July 6th when she detailed the intricate process in which she builds up her botanical drawings of a leaf or stem (or even a mature tree) from a rough preparatory outline with a pencil to the multi-layered finished article in ink. Sarah is a remarkable graphic artist and her status has been confirmed with the work in her three major reference books that she has both written and illustrated. Her drawings have a wonderful elegance, often depicting movement and energy, and highlight the structure and function of plants - demonstrating her extraordinary skill and passion for her work. 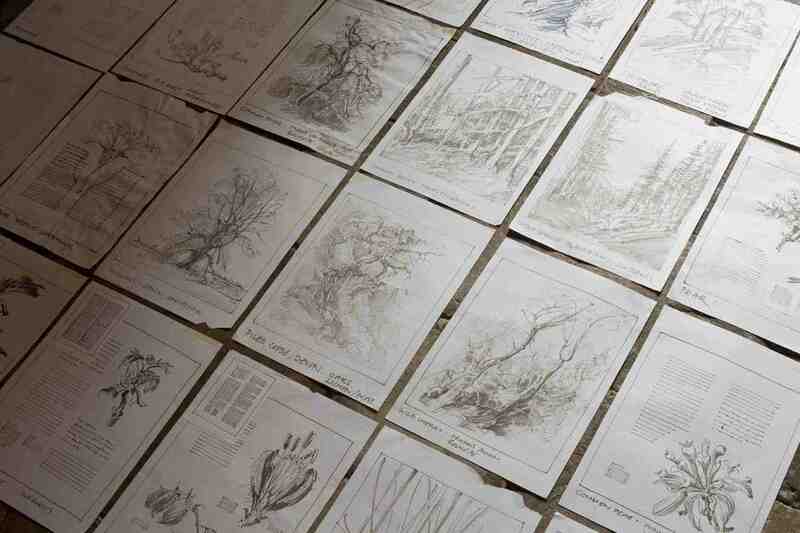 Sarah's latest major project is called The New Sylva - a discourse of forest and orchard trees in the 21st century - and is due to be published in 2014 with over 200 drawings, to mark the 350th anniversary of the publication by John Evelyn, the English diarist and garderer, of the original Sylva in 1664. Sarah offered an intriguing insight into the process of entering often dense woodland and tracking down specimens for the book, such as magical oaks with moss-covered roots, and drawing them in situ rather taking photographs - or bringing back smaller items to her cottage-studio in Wootton to convert into exquisite art, using a simple dip-pen. Indeed, her work is so highly prized that her drawings feature in both private collections and those of national institutions, such as the Royal Academy of Art and the Ashmolean Museum, in Oxford.. Recently, Sarah scoured Oxfordshire, with the help of Gabriel Hemery, a forest scientist and her co-author on The New Sylva, trying to track down male flowers of walnut trees which had become hard to find because of the poor weather. Eventually, she found a few specimens and then showed us the painstaking process of capturing the morphological features and slowly building up the drawings until they look like they could be picked off the page. She has spent countless hours working on the flat-plan for The New Sylva, roughly drawing the entire 432-page book in miniature, so as to plan and organise the whole contents before making final drawings. The only slightly negative note is that even the best quality printing can never truly match the detail of the original work - some of which will be held in trust by the Sylva Foundation charity when the project is complete. Sarah, with a disarmimg modesty, is equally skilled in drawing human anatomy and she has also published a book on the subject. She is a tutor in anatomy at the Ruskin School of Drawing and Fine Art at Oxford University and contrasted the modern approach to the discipline with that of Leonardo, who - in taking the first steps in depicting the human body - made anatomical mistakes, as well as discoveries, which only emerged in later years. 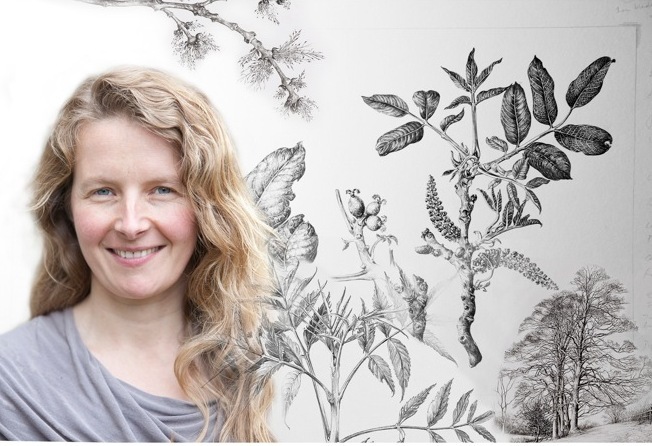 In tandem with her remarkable artistic ability, Sarah is also a renowned academic and wrote her doctoral thesis on drawing and the nature and making of visual illusions. To do this, she looked closely at the European art history and social history of human dissection and taught herself skeleto-muscular anatomy. She outlined to us her work with primary children and undergraduate medical students who she teaches anatomy through drawing at the National Gallery and also at Barts and the London School of Medicine. Sarah has been drawing and sketching since the age of two, perhaps following the example of her mother, who was a graphic artist (and at one point, Sarah was even sent to see a doctor because she was interested in almost nothing else). Almost like breathing, Sarah still finds herself sketching endlessly, often trying to capture movement and energy, and (in less rarefied moments) even knocks off cartoons, like the one of a man eating a nun after she became so frustrated on a motionless train at Nuneaton Station. Her overriding passion is that anybody can learn to draw if they want to - and that it is never too late - and a few years ago, in a BBC 3 television documentary she taught six people to draw over six days. They all made significant progress and one person was directly inspired to go to art college - and she has since become a professional artist. 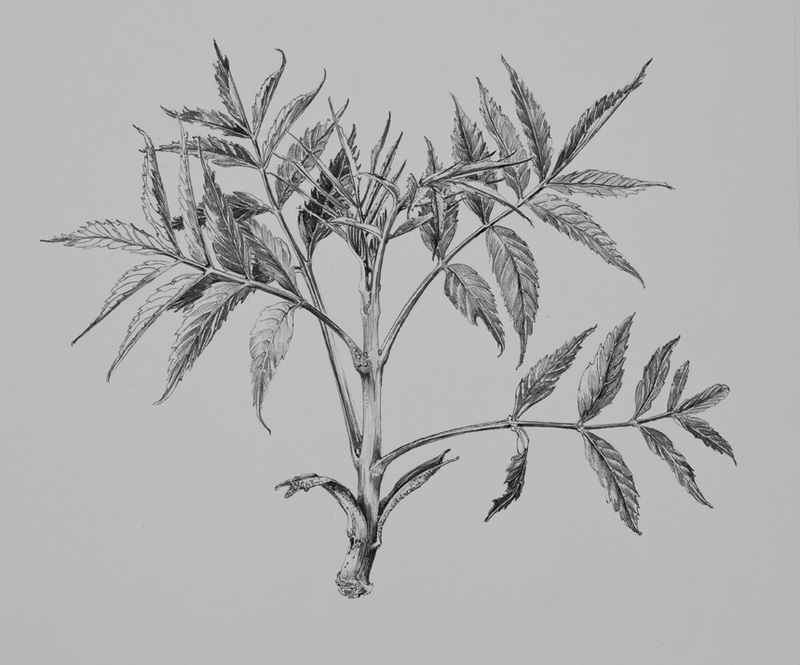 Looking at Sarah's intricate drawings of leaves, buds and flowers, it was self-evident it would take years to produce that quality of art - but, equally, others must have been inspired through Sarah's boundless energy to take that first tentative step. "After a wonderful introduction, we sat enraptured as Sarah's boundless talent, energy and enthusiasm made this talk a fantastic end to the season of Wootton Talks. She communicated her subject so well and we were treated to a superb, visual presentation of graphic illustrations to accompany her exuberant talk.